This summer at all three Los Angeles locations of the Korean restaurant Bibigo, Korean pop megastar Psy, also known as the King of YouTube — or his actual name Park Jae-sang — is everywhere. On the front windows, the servers’ T-shirts and even on the menu. Millions of people dance like him, and now everybody can eat like him too, as Bibigo is offering a special menu of Psy’s choosing. 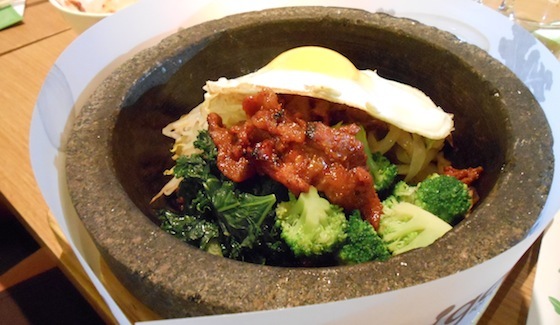 Already a big fan of Bibigo in Seoul, whenever Psy is in L.A., he visits the Bibigo on posh Beverly Drive in Beverly Hills. Until July 31, customers who order his favorite dishes receive a scratch card with the chance to win prizes like a Bibigo voucher, bag or Psy mask (!! ), and can enter to win a trip to Seoul. The winner will be announced August 19, 2013. Psy’s massive hit “Gangnam Style” has over a billion YouTube views. He released his follow-up single, “Gentleman,” in April, and it quickly earned a Guinness World Record for the most-viewed video online in 24 hours. 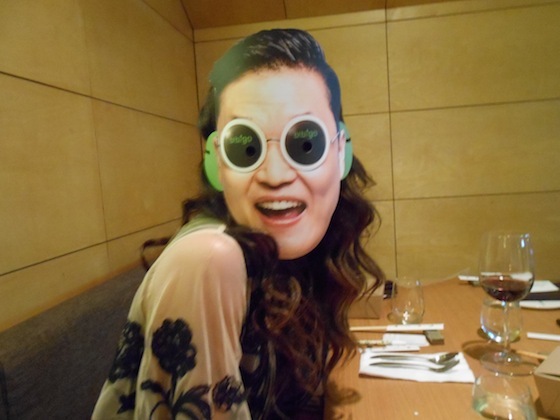 In the latter video, Psy meets his female match and they head to a restaurant and begin playing with their food. Apparently, these are some of Psy’s favorite dishes from Bibigo, which also has locations in the UK, Japan, China, Indonesia and Singapore.